So I've taken my chow(15 weeks) for her regular check ups etc and the veterinarian says she is as healthy as can be..but I've noticed that she scratches Her neck and chest a lot, she gets her frontline every 4weeks so it can't be fleas uhm I asked the vet about it and she said I shouldn't worry about it and recommended a shampoo for irritated skin..but its just not doing the trick(sad face) I hate to see my girl scratch like that! make sure the claws are trimmed properly. it may not even be a case of dry or itchy skin. dogs (any breed, not chow specific) can develop a habit of just scratching and chewing at themselves for no reason. it may start out of boredom or some other issue and just become the norm. we have a very specific training regimen for 'leave it' that includes items we dont want Rory to play with, and it includes his hind quarters. sometimes he listens, other times not so much, but it does reduce the mess he can make out of his fur. Do you live in a high flea area? If you don't then I stop the frontline. 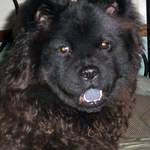 I've never treated any of my chows for fleas and they've never had them; ever. What vets won't tell you is that some animals are allergic to the flea and tick treatments. What only holistic vets will tell you is that healthy animals shouldn't even be tempting to fleas and ticks, unless your area is infested with them and they get on everyone. Make sure her food has no corn in it, no wheat, fillers, artificial colors and preservatives, these also cause skin problems. So sorry to hear about your furbaby having a case of the itches. I had a similar experience with Whitby. I had her on a flea med and she still kept itching. She’d scratch her front armpits, her chest and was licking herself and her front paws. I couldn’t find any fleas so I decided to take her to her vet for a look-see. The vet didn’t find any fleas on her either. After a short conversation we came to the conclusion she might be allergic to grass. My previous chow, Chloe, had Spring and Fall allergies connected with lying in the grass and the weather changes. Long story short, the vet put her on Cetirizine, which is an antihistamine. She’s been on it about three weeks now and the itching has stopped. This might be something you might want to run by your vet. Wishing you and your furbaby the best. Victory wrote: Make sure her food has no corn in it, no wheat, fillers, artificial colors and preservatives, these also cause skin problems. Our female chow Stormy used to scratch herself all the time, I purchased special shampoo and spray but nothing worked until I switched her food. She now eats a grain free dog food and her itching has stopped. We don't have an issue with fleas so I've never given my dogs Frontline. My golden had a problem with constantly scratching and chewing on his legs. He was covered with hot spots. I started giving him Premium Plus Skin and Coat from Dr. Foster and Smith (I order on line) and he has stopped the scratching and chewing. He hot spots are all gone. If your baby has dry skin, you could give this a try. It is an oil and you put on their food at meal time. Wow thank you so much for all the responses..I will definitely try some of your methods.. I am a first time chow owner so I just wana do things right lol. I don't live in a high flea zone infact here's no fleas at all so I will start by stopping the frontline treatment, I just thought it would make sure she doesn't get fleas at all, not knowing that she might be allergic to it(dumb moment) uhm her next check up August 20th then I will mention/discuss your ways of doing it with the vet! Dermatitis is the term used to describe a wide range of skin inflammation. Skin can get irritated for a variety of reasons.